Week 30: it wasn’t supposed to take this long! As mentioned in the previous post, with only one (albeit excellent) plasterer, this phase of the work has taken much longer than originally expected – with the odd day off, extra public holidays and the like, 12 instead of 4 weeks. But the plastering is now finished bar a day’s work in the passage way containing the stairs, to be done when the stairs have been installed – and the stairs have(has) arrived, all in bubble wrap (not really a picture – but, lying on its side, it made a useful shelf for the kitchen fitters to lay their tools out on). 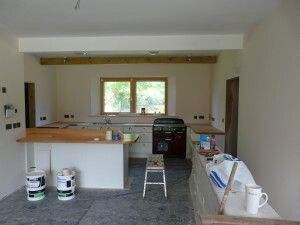 Yes, we now have a kitchen as well, fitted last week, complete with cooker. Given that there is no gas connected – it’s difficult in my view to have a zero carbon house that uses gas – the cooker has either to be a wood burner or to be electric. From friends’ experiences with wood burning cookers, this seems to be a “high labour” option. So, as this is also our retirement home, designed for older people, electric it is. For what we understand to be high efficiency, we’ve chosen one with an induction hob. We’ve never had one before so this is another step into the unknown. Induction hobs are said to be extremely controllable, like gas or even better. The heat is generated in the pan bottom, so the top of the hob only gets hot where a hot pan touches it. For safety, the induction zones can only switch on if there is sufficient ferrous material above it. A non-trivial down side is that our still-good-as-new, Silcro, copper-bottomed wedding-present saucepans won’t work on this stove. We have bought some (pretty cheap) new saucepans, etc. Further, at long last, the front door has been delivered. To contain shipping costs it came into the country with a consignment of windows for another job and so has arrived without its door handles. We can manage without these for a while – it locks. Between dining room and downstairs bathroom/ensuite there’s a solid wall, part of the thermal mass included in the design (see separate note under Definitions &c). 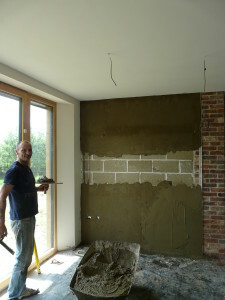 Here the heavy block wall is being rendered (with sand and cement) before being plastered. 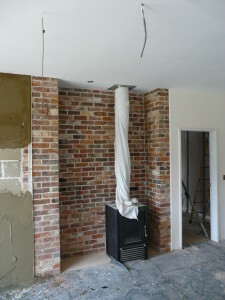 Immediately to the right is the wood burning stove in its second-hand brick alcove. These two sections of wall contribute significantly to the thermal mass in the house. The exposed brick makes a change from what would otherwise be painted wall. While the plastering has been going on downstairs, we’ve been painting upstairs. There’s a lot of it, it doesn’t make for interesting reportage, and it takes a lot of time. It’s also quite hot. The MVHR arrived and has been put away safely. Its installation is held until the control room has been painted (which it now has) because it’s much easier to paint without it there! Until the MVHR system is installed there’s no air circulation in the house, so upstairs is hotter than downstairs. Despite our poor summer, the thermal store is full of hot water and there’s heat leakage from the pipes (bit more lagging to do yet) and the inverter gives off heat while it’s working – the sun comes out (yes, it does) and the inverter’s note changes and its temperature goes up. The house is very well insulated – so you have to open a window. Until the internal scaffolding came down it was easiest to open the roof lights but now you have to find the long pole to do this. This entry was posted in Electrics, Thermal mass, Uncategorized, Zero Carbon House. Bookmark the permalink. Hi, I’m just wondering if you still have your Silcro pans? I have been looking for a set to replace the ones my parents got as a wedding present 40 years ago that we’re in daily use until they were sadly lost in a move. I would love to be able to find some as an anniversary present, but am struggling to track any down. If you could bear to part with them, I’d be very interested to buy?